Don a wedding dress and join the Brides for this annual San Francisco tradition at the 21st annual Brides of March. Join in to parade through the heart of San Francisco, strolling through Union Square, shopping at fancy stores and drinking in local bars with your fellow brides. All you need for this event is a white wedding dress, the more elaborate, the better. Check your local thrift store for suitable attire. You’ll have a few rounds of drinks at the bars and wait for late arrivals. By 3:30 pm, the brides will be suitably liquored up for a stroll around town, with stops at their favorite formal wear store and diamond importer. Leaving from the Tunnel Top, they’ll go down on Bush, turn right on Kearny St., then continue down to Maiden Lane, stopping for a group photo op at the Maiden Lane gate. Then they’ll race across the street to Union Square and gather around their edifice of desire, the monolith of John Dong Long. From there, they’ll proceed across the street to an exclusive department store for a fresh application of lipstick and makeup from the counter samples. If you are a photographer, wear a dress please. They’re tired of you stealing their Juju without participating. The best parking is the nearby Sutter-Stockton Garage, with entrances on the 400 block of Stockton northbound and on the 500 block of Bush eastbound. The Annual “Brides of March” is put on by the San Francisco Cacophony Society, who run flash-mobby-type events and in general try to make sure that life in the city isn’t too stodgy. 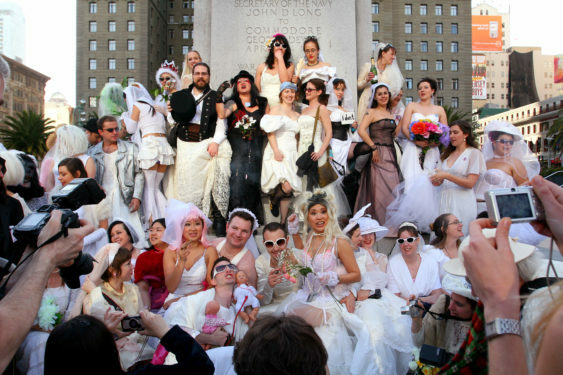 This is a lot like Santacon (where everyone dresses up as Santa), but in wedding gowns. Every year is different, but typically there are several stops along the route….Tiffany’s, Victoria’s Secret, Selix and lots of bars in between. It’s a riot as long as there are fewer photographers and more dress wearers.